And the mundane procession begins. More physical therapy today seeking range of motion, lots of rest and icing. All in all, I couldn't ask for much more two days after surgery. Save some pain on the inside of the tibia where they drilled a hole to insert the new ACL, the leg is feeling great. Elaine also seems to have turned the page, spending yesterday doing uphill running intervals in the mid-day heat. For both of us, this forced down time for me is a chance to re-assess and figure out how to improve next year and each year beyond. 10. There was a time this February where it snowed as much as I've ever seen it snow here. Everyday, the snow piled up in inches and feet. There are few things better than loading up the pack with food and layers, walking out your door and skiing west, seeking adventure, solitude and turns. Here's Elaine, breaking trail, heading to some of our favorite places on earth. 9. This photo was taken three days ago on Monday. It was my last ski of the year before ACL surgery, less than 24 hours before going under the knife. I've logged the sensations in my head, especially the feeling of the turn, and every day plan to visualize skiing, so when the season comes again, it's automatic and better than ever. This photo signifies defiance, stubborness and a determination that this will not beat us. 8. 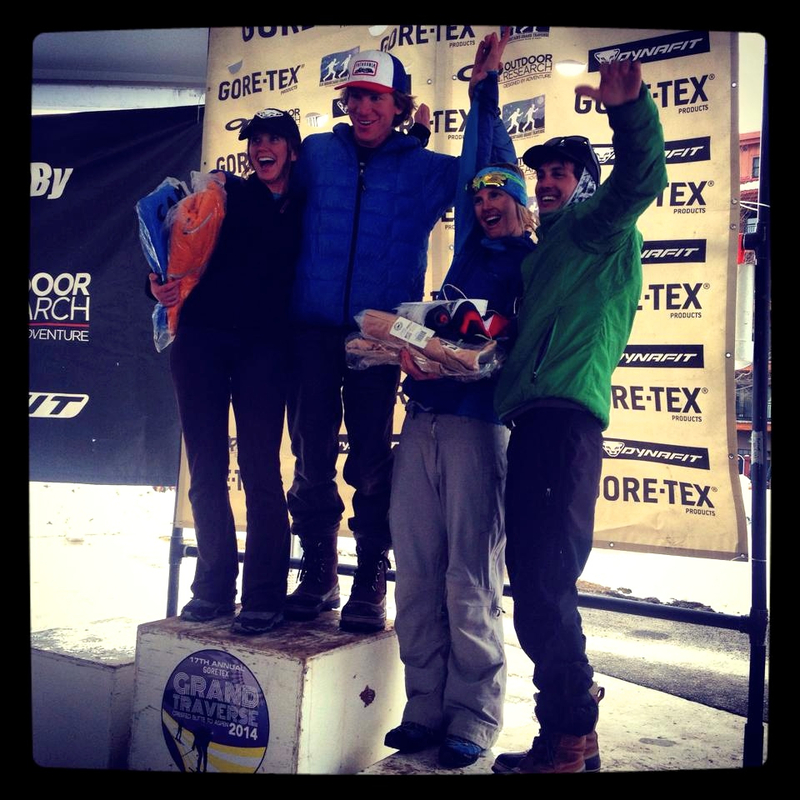 Early season is a time of re-birth for skiers. In October we regularly headed up to Butler Gulch in search of fitness and winter soul (and occassionally, a little snow). 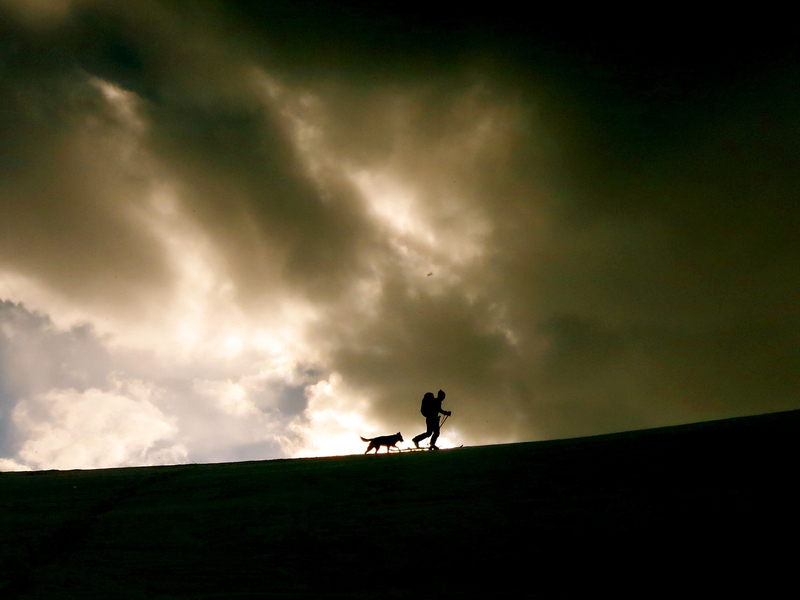 Elaine and Stella make their way up to the top of the Continental Divide as the evening light and sky rage. 7. Elaine and I both started skiing at age two. In between there have been lots of days at the resort, chasing gates, weaving through trees and bumps and searching for that perfection that only an untracked powder day can bring. Yet we've both felt a major renewal for the sport since we got married back in 2010. It's what we love to do, and it's the fact that we get to do it together almost everyday that makes it so special. This photo captures that feeling after spending a day in the Wilderness on skis, walking down main street and heading home, to do it all again the next day with the person you love most in the world. 6. We're lucky to live where we do. This ski is a 30 minutes skin from our front door, and a source of the everyday morning (and sometimes evening fix) when long work days await. It's a short little shot through the woods, and when it's good it flows like a raging river. Here's Elaine finding that morning flow. 5. 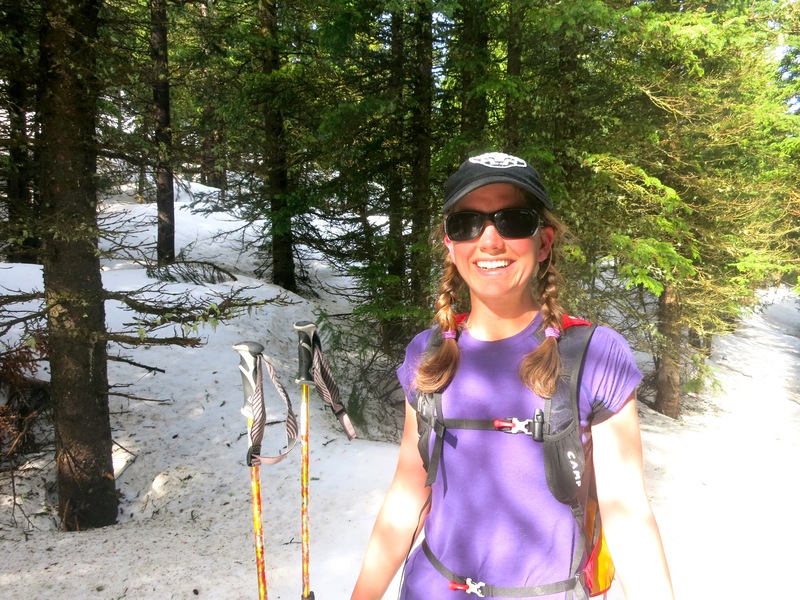 On New Years Day, on a whim, Elaine and I decided to take a trip up to the mecca of North American backcountry skiing, Roger's Pass in British Columbia. The terrain here is amazing, and it feels like the ice age is still alive and well. 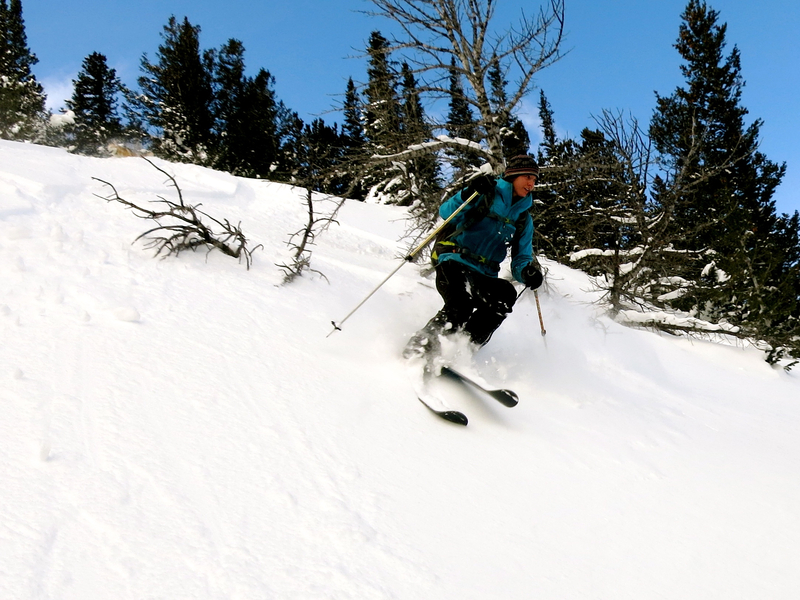 Here's Elaine breaking trail through a foot of fresh snow over a glacial moraine to bluebird, once-in-a-lifetime, above timberline powder turns off a Canadian mountain summit. It doesn't get much better. 4. 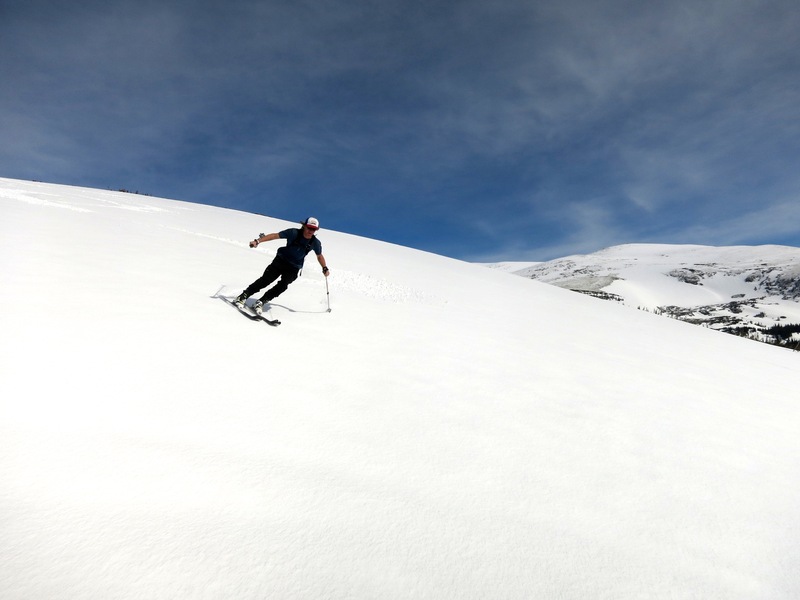 There are few things more attractive than a good skier. Elaine has a certain cat-like quality to her turns. She's quick as a whip in the trees and bumps, and has a classic, balanced style in powder that I love. 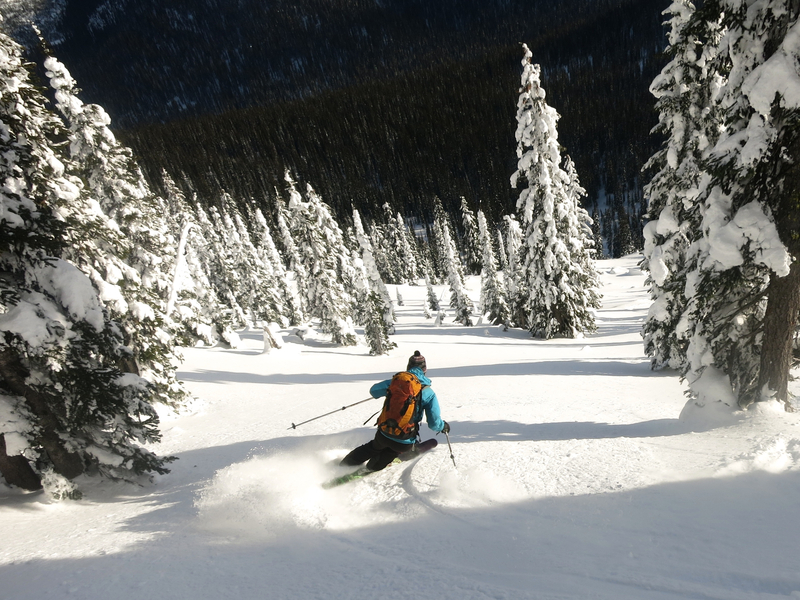 Here she is showing off her curves in Selkirk powder off Kootenay Pass, British Columbia. 3. 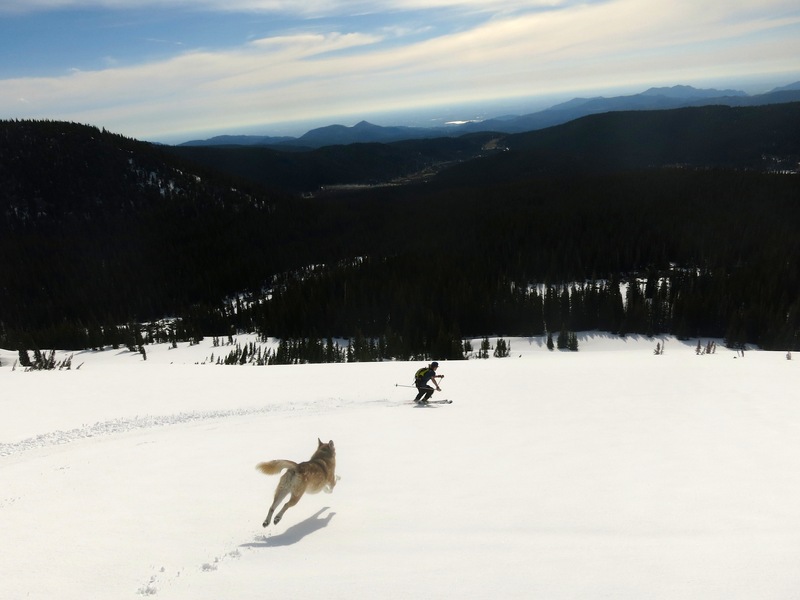 The Elk Mountain Traverse is a major objective. And while this year's reverse proved mentally challenging to the point that we had a bit of a break-down, you can't whine too much when you get the top spot on the podium. We have bigger aspirations moving forward, but are proud of what we accomplished this season. 2. 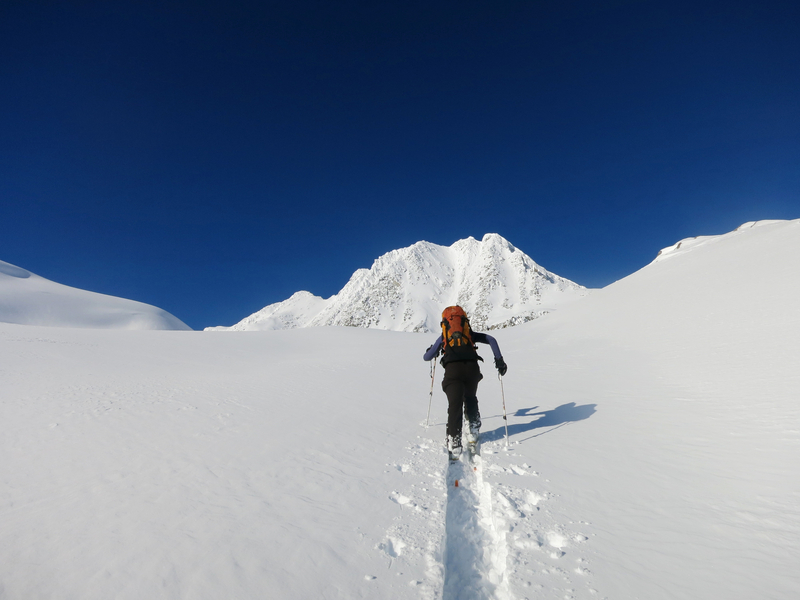 When we arrived at Rogers Pass the Canadian ranger told us that we should skin to the top of this mountain and ski down. Hell of a call. 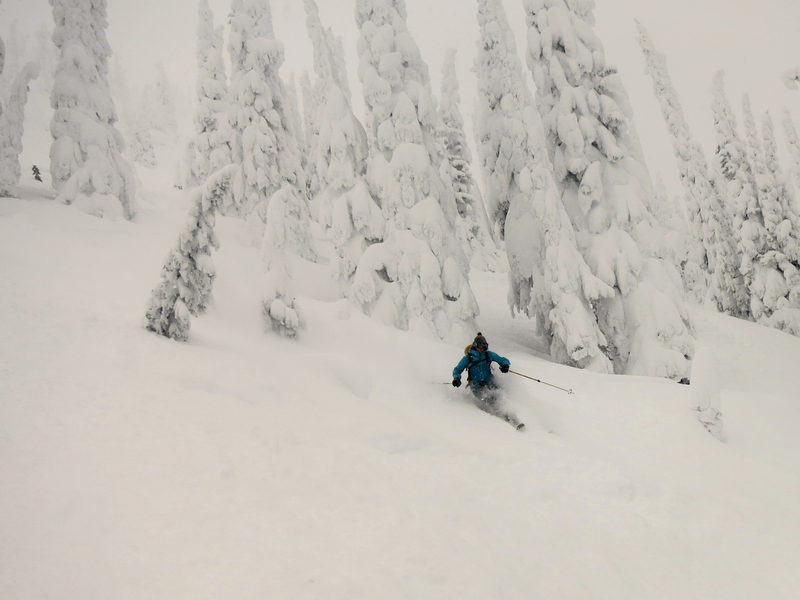 It was the first time I've ever skied in powder up to my shoulders, and it took a bit to figure it out. Elaine seems to have found the trick in this beautiful turn through snow clad trees and a winter wonderland. Days like this are a major reason I elected to have ACL surgery. Truth is, I was holding back skiing on this day, and it was deep down knowledge that my knee wasn't quite right that caused that. I'm looking forward to coming back to it with the freedom in motion that it deserves. 1. 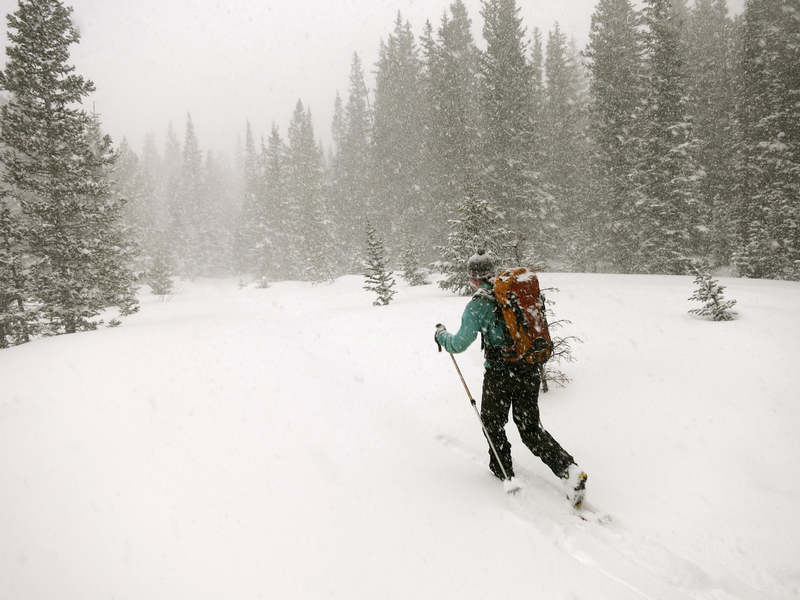 No offense to Canada, but the deepest snow we found all year was about three miles west of our cabin in the Indian Peaks Wilderness. 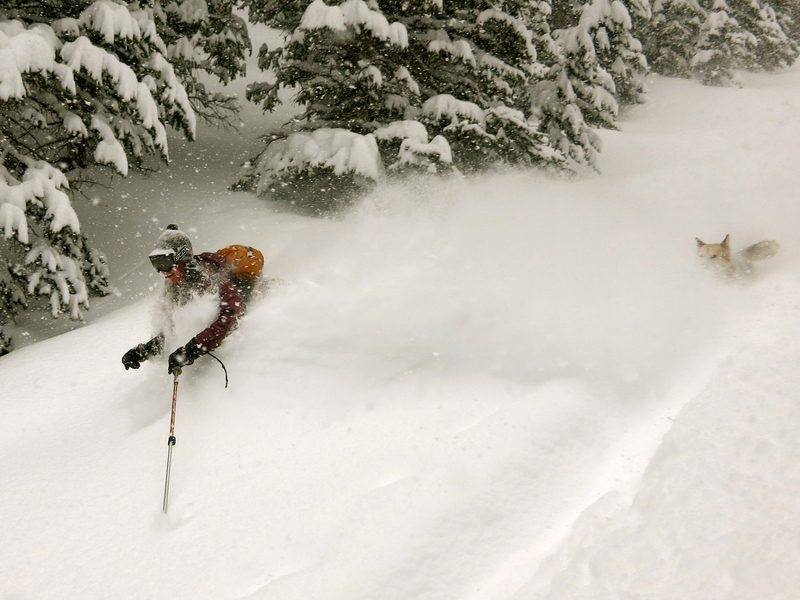 It was snowing three to four inches per hour and it led to an amazing day of powder plumes, snowy dogs and huge, huge grins. Here's to a great 2013-14 season. We're stoked to wind it up and have an even better 2014-15 winter. Orange Sklar on the top of Trail Ridge Road in Rocky Mountain National Park. D-day for knee surgery looms in four days. At this point in time – save for a somewhat fear of surgery and anesthesia and the unknown – I'm ready. Mentally, I've let go of what I'm missing this spring and early summer, instead focusing my energy on the fall and winter of 2014/15 and the steps required to get there healthy. I've given the past two weeks a name, phase one, chosing to mentally begin the process now and not at surgery date. It's a cheesy name, but I don't care. This first phase of this whole process has focused on being as fit and strong in the legs as possible before surgery. That's meant a return to the best leg strength machine I know of, the bicycle. It's worked – in the last two weeks my legs have gotten stronger. And in the meantime, I've fallen back in love with the ride. It helps that almost simultaneously with the news that I need knee surgery I also had delivered to me the sweetest bike I've ever ridden, my Sklar. It's beautiful, balanced and smooth. Most of the week has been spent riding on winding mountains roads, and while it's a very competent performer in those situations, it truly shines on the trail. Elaine, Old Man Vigers, Miss Patten and I took to the logged routes on West Magnolia today and did a singletrack christening of the new Sklar. It rides wonderfully; balanced, smooth and spry. It's truly a surreal experience, seeing the old trails in an entirely new clear cut landscape (Hobbit One is silly without the trees). And while the loss of forest life is painful to see, I believe this area will be stunning with meadows and flowers and aspens and animals other than squirrels in 20 years time. That right there is motivation to keep on riding. Near the end of the ride, the thunder rose and the rain came beating down as we wove through the rivulettes and puddles like little kids. 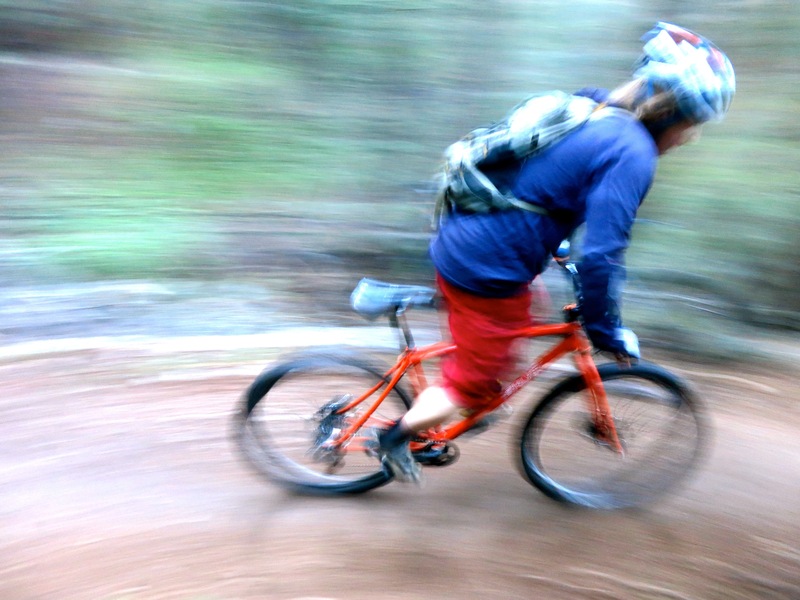 For Elaine, mountain biking is a totally new experience, and it's fun to see her improve as the ride goes on. She already has a job for while I'm recovering: spend as much time on technical singletrack as possible! Overall, it's been a physically progressing time to balance out a mentally taxing week. I'm looking forward to finishing up this part of the process strong, before we enter phase two – surgery and rest. Woke up Thursday morning looking for a new experience. 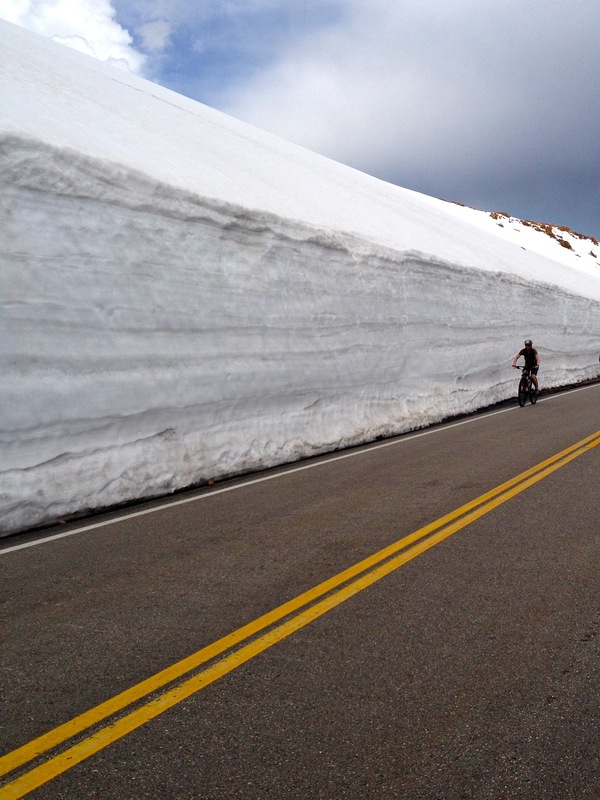 When we saw on the internet that it was the last day of the season that Trail Ridge Road in RMNP was closed to cars, it became obvious: load up the bikes and ride to the top, sans traffic! 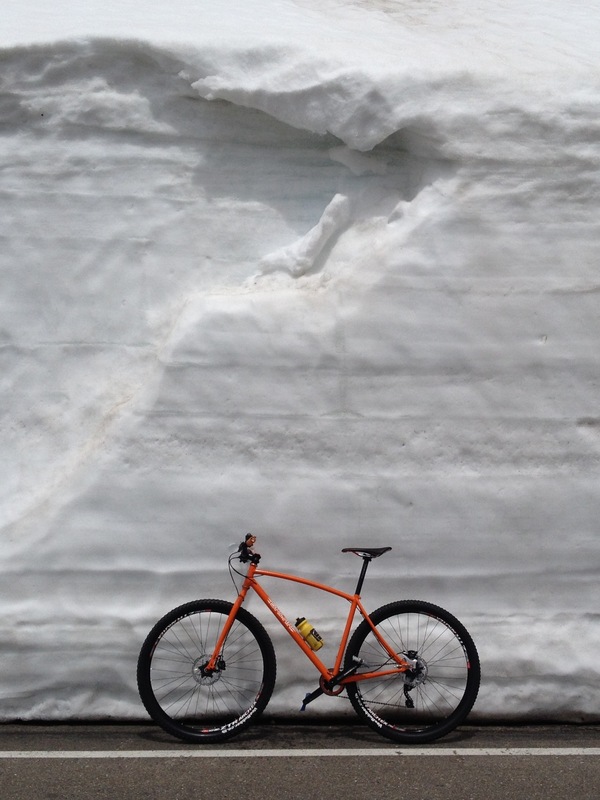 A wee bit of snow up on Trail Ridge Road and a very orange bicycle! The past week has been the biggest biking blitz I've been on since 2007. It's amazing what a new bike can do for motivation. I still love going uphill on a bicycle. I'm looking forward to the time in therapy where long climbs on the bike are possible and recommended. 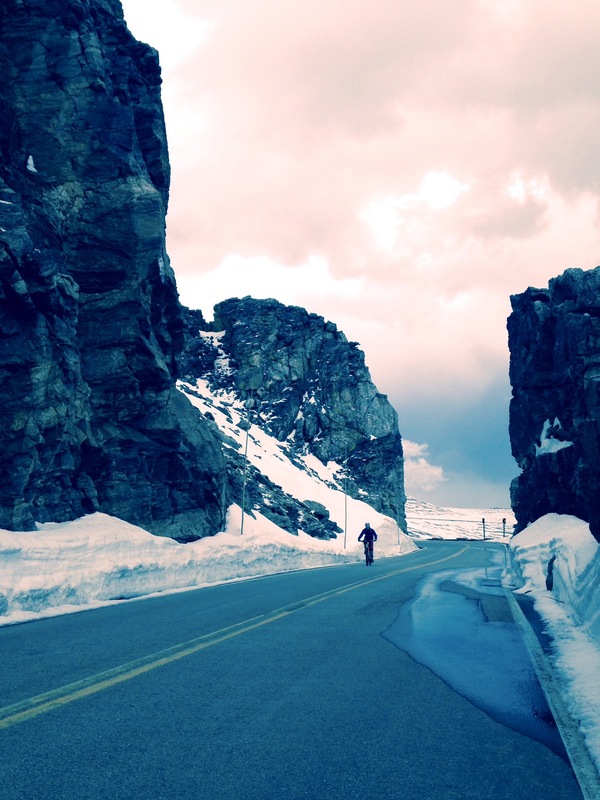 Coming through Rock Cut near the very top of Trail Ridge Road. 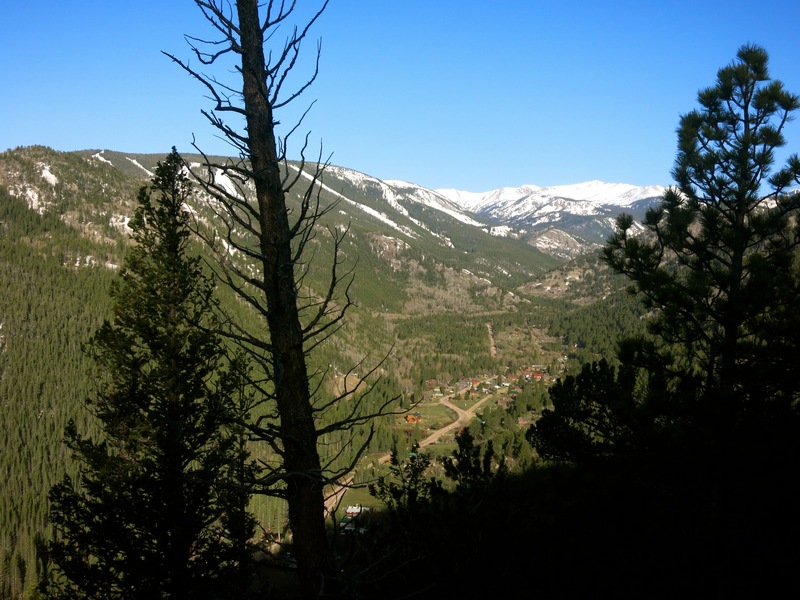 Since the normal mountain we hike is a flowing stream of run-off and myd, we've been taking to the drier north side mountain and heading up a local jeep trail for dog walks and morning sanity. 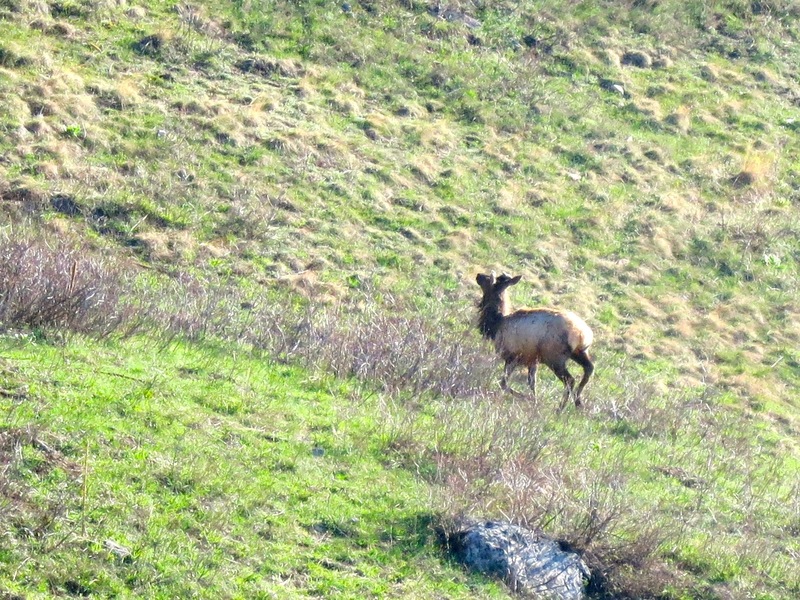 I came upon a herd of elk, as well as deer and ptarmigan up here. Today we saw a golden eagle circling overhead. It's nice to live in a place like this, with nature at our doorstep. I'm lucky to have this as my place for recovery and rejuvination. That's home down there in that valley. 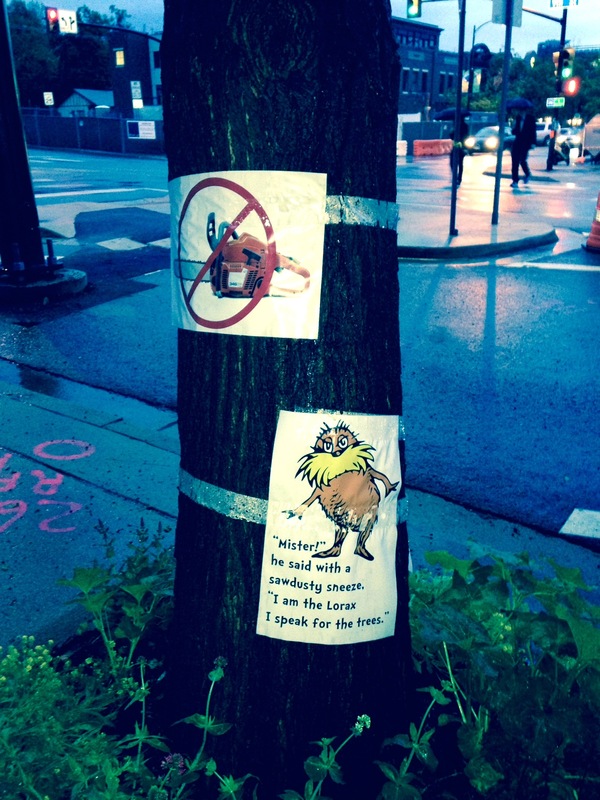 Apparently there are plans to chop down these trees on 9th Street as part of a downtown revitalization. Boulder can be strange sometimes, but I love this, and the fact that people who think like this live here. Eerie day at work today. It conjured flashbacks to five years ago, back to white walls, plastic sheets, a face pushed down on the dirt and some dark, dark days and nights. To see someone go through something similar is tough to watch if you have any humanitarian side to you. It's more than I'm trained to handle, truthfully, and we're leery of getting too involved. But, if somebody reaches out for help and they're about to fall off the edge, do you just block them out and do nothing, or do you try and offer a little helping hand? I offered a slight hand today, and it does not make me a better person. It did, however, remind me of a place I never, ever want to go back to. The chaos of the day bookended by bliss. In the morning, a walk in the woods with a little bit of skiing thrown in. The valley echoes now with the raging creek. Spring is everywhere around us. The smell of pine, of wet rock, of melting snow permeate all. 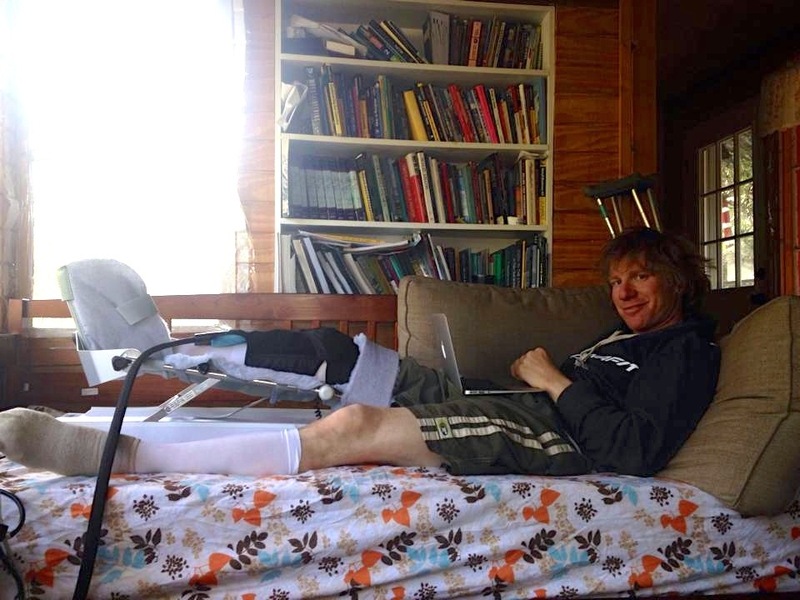 One thing I will greatly enjoy during knee recovery is just sitting on our deck, listening to the creek roar and the birds feed, while reading adventure narratives from Shackelton in Antarctica, Nansen in the arctic and Ed Webster on Everest. To find motivation during challenging times, it's good to tap into the greats. 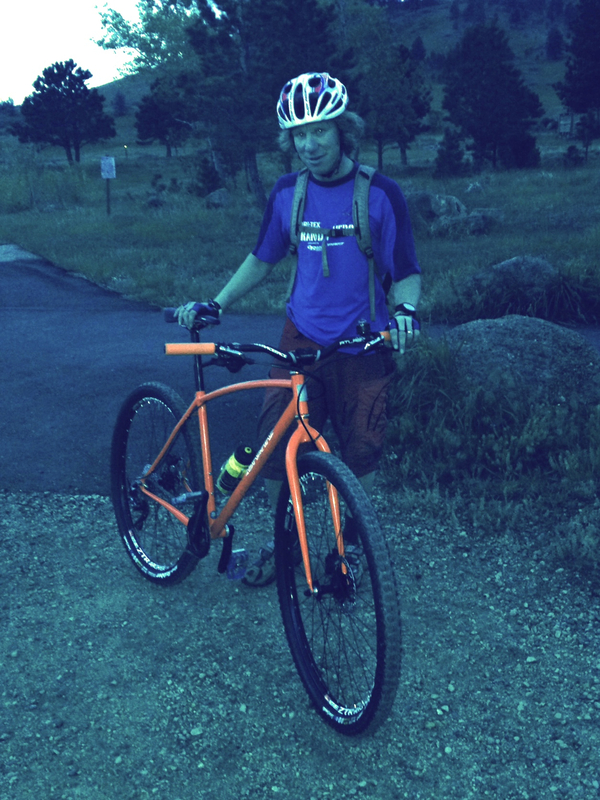 And then tonight after the chaos died, pedal stroke by pedal stoke, taking the Sklar up a little mountain near work, listening to the grasshoppers cry and enjoying the evening light and air with my beautiful wife at the exact spot where the Great Plains meet the Rocky Mountains. This road crawls under the Flatirons, a Boulder icon. The Flatirons are the remnants of an ancient, gigantic 280 million year old mountain range that rivaled the Himalayas in size. It's not a bad place to ride a bike, and it's a wonderful spot to let the stresses of the day blow away with the spring breeze. 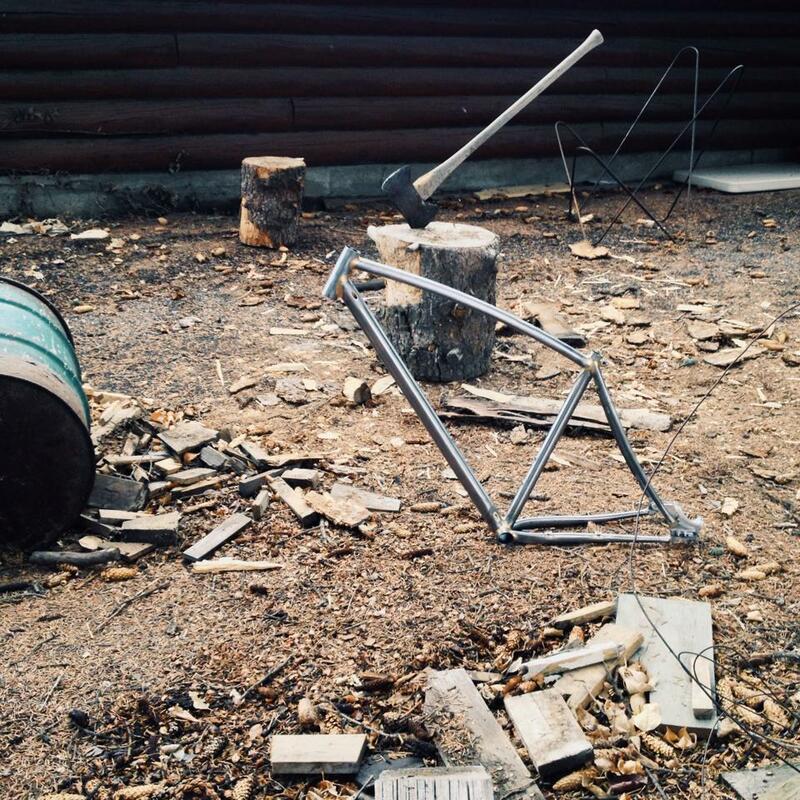 My Sklar bike, pre-paint, in a Montana wood pile. I had a nice early morning ski up and down the mountain behind our house this morning with Stella, and a great ride up Flag this evening after work as the evening light died. If I'm going to get surgery, I'm going to damn well make sure I'm in as good a shape as possible before hand. There was a moment riding down the mountain with Elaine where a raven flew right along side us for a good 30 seconds. When I lived in Boulder I used to ride Flagstaff a lot, and I enjoyed watching the ravens soar every which way. It may be hokus pokus, but there is a spirituality and kindship I feel with them. I love my Sklar bike. It's a beautiful machine and climbs very well. Beyond that, I like the fact that it was made in Bozeman, Montana, by a creative and talented kid between powder runs in a garage with an oil barrel wood stove and a deer hanging from the rafters. When you get a custom frame, you're choosing your builder based on their ability to weld and design, but also by who they are and what the represent. 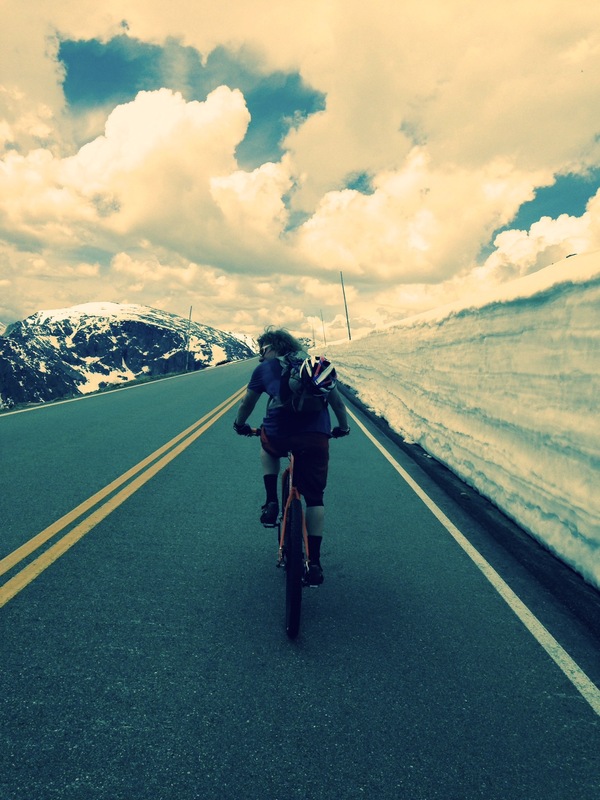 Adam Sklar is a skier, a biker, an inventor and an adventurer. That's combo works just fine for me. 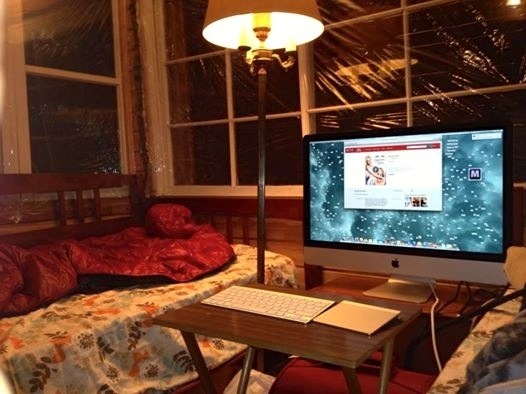 Sklar First Impressions: Through the Roof GOOD! 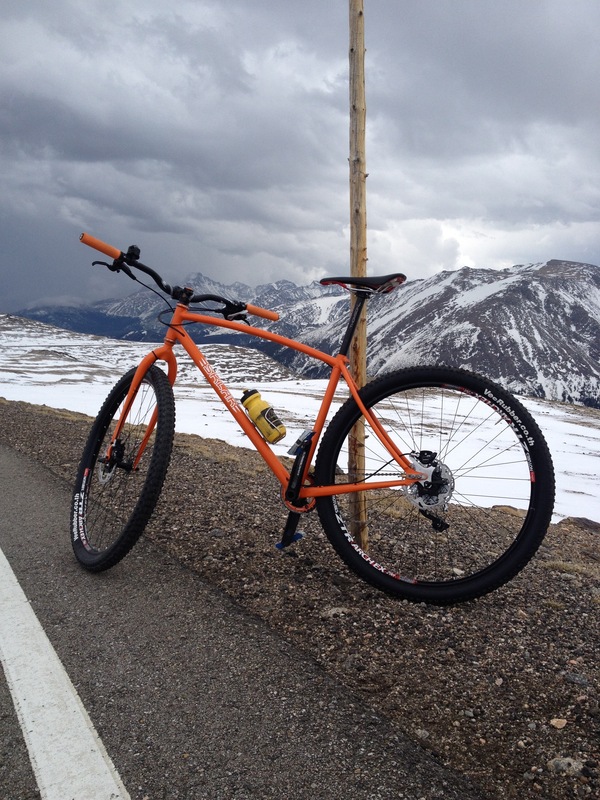 About a year ago I ordered a bike from a kid named Adam Sklar who I used to coach when I worked for the Singletrack Mountain Bicycling Association. Adam is a great guy who has shown a real passion for framebuilding. I'm not sure if I approached him or he approached me, but before I knew it I was on the "list" for a Sklar Bike. It took a bit to get, as Adam is in school full time at Montana State, but good things come to those who wait. When I ordered mine, I believe he had made two or three frames total so he cut me a ridiculous deal as a trade for being something of a guinea pig for the first frames. Well, that was a great decision on my part. By the time he got to my frame, he'd built about ten total and his systems were dialed. He even built a matching fork to boot. I took it on its first ride after work yesterday. Just a little climb up a mesa west of town, and then along some old dirt service roads. What can I say…the Sklar is pretty damned amazing. It's an absolute winner. My first impression was, wow this thing REALLY fits well. It's like an extension of my body. I've never felt that on a bike before. It's very quick accelerating too. I've only ridden it on the road thus far but I can tell it's going to handle like a dream. It has the perfect balance between being peppy and stable. Beyond that, it looks incredible. It's really, really eye catching. 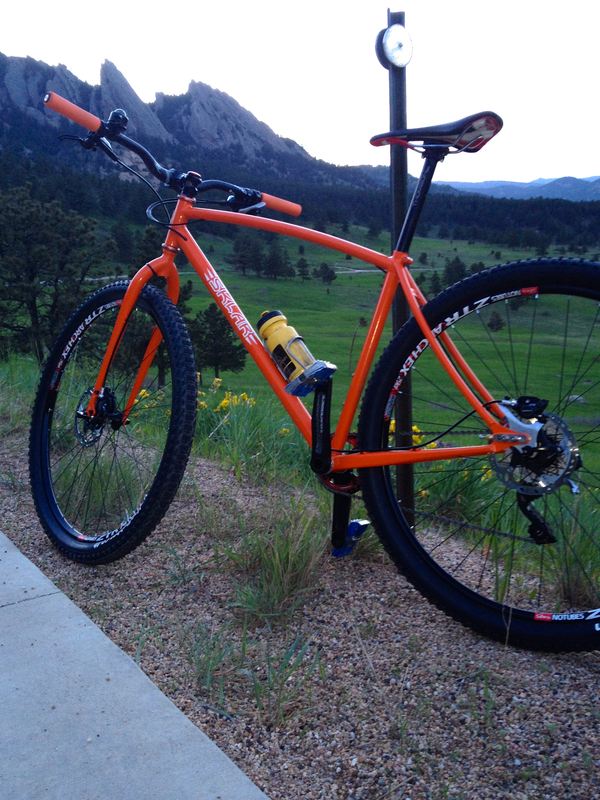 It comes in at exactly 25 pounds which is pretty damned good for a geared, steel bike. Beyond that, it's just fun. Really fun. So fun that I can't wait for my next ride. Simply put, I couldn't be happier. It's a little bittersweet to have it ready so soon before surgery, but what are you going to do? Ride the hell out of it for the next nine days and then, come August, use it as a major tool for the road to full recovery. Thank you Adam Sklar. That little project bike you made for me just made me fall back in love with biking. And while I'm excited to use it later this summer, what I'm really excited for is the adventures it will bring over the next decade or so. The last few days have been up and down. There is the bravado that getting this surgery and coming back is going to be an easy process, but I know deep down it'll be anything but. There are a lot of things I don't like about it, and most of them have nothing to do with the surgery – although that is scary unto itself. 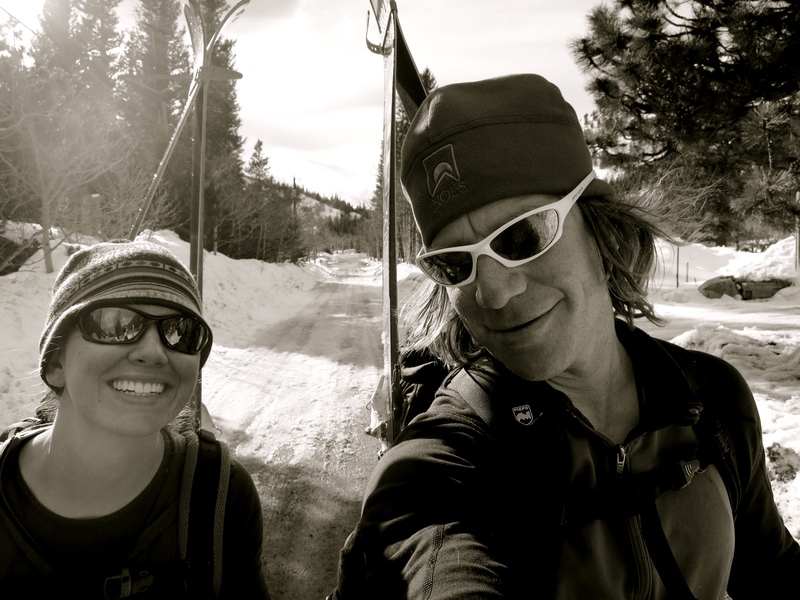 It's the atrophy of the muscles, the lack of endorphines, and more than anything, missing out on adventures with my wife. I know in the big scheme of things it's pretty minor, and it's not forever, but it's tough. I think the other thing that is a bit perplexing is that I've apparently been coping with this injury for basically two decades now, and while it occassionally gives me problems, it's hardly like I can't do the things I love. 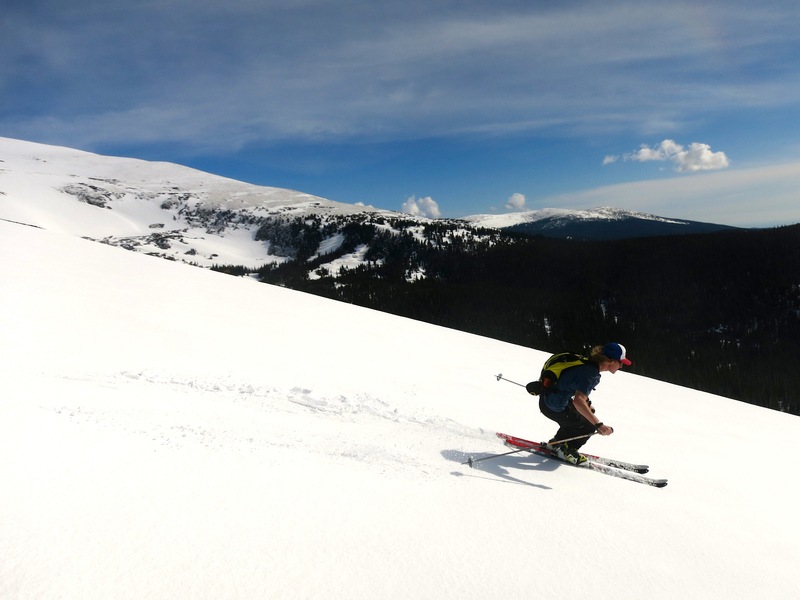 I've skied 650 days in the past four years, and until April 4, problems have been very minimal. I do think one of the reasons I coped well for so long is biking, and I don't think it's an accident that the latest episode happened after a summer where biking was minimal. The thing I wish I knew was if it was totally torn before April 4, or if it was 10% intact and that was enough for me to do the things I loved. If it was totally torn for the past 20 years, what's the big freaking deal? Get strong again and keep her rolling. On the flip side, Dr. Hackett is the absolute best and I'm very confident it'll go well. He's not using my patella or hamstring for the graft – it'll be from a cadaver – and that will speed the process even more. And the truth is, even if I don't get the surgery I'll be mentally doing rehab work all summer long. Would it be better to do that rehab work on a knee that is completely fixed and suffer initially more, or do it on a knee with no ACL and hope for the best? These are the thoughts vascillating through my head these days. I'm definitely leaning strongly towards surgery, but I think I might get a 2nd opinion from a physical therapist. I just want to get it right.